What do I like about this? It incorporates “values, mission and strategy”, which is, of course, the starting point for all operating model work. It has more of a focus on people than most models. I particularly like the visuals against this part of the framework, which seem to give extra focus on individuals and on relationships. Those who have been on my course Advanced Organisation Design will know that my definition of good organisation is “capable people working well together”. I also like the balance of service, process and people, clearly the three most important ingredients in an operating model. Where might I criticize? The framwork separates ‘services’ from strategy, which feels odd to me because I think the decision about what services or products to offer and which customers to serve is the guts of strategy work. This framework does give emphasis on services (or what the Operating Model Canvas calls “value propositions”). In other frameworks, this is often presumed rather than explicit. However, the customer or beneficiary is presumed (I assume part of strategy) rather than explicit. As I have often commented, a way of keeping the customer front of mind is helpful when doing operating model work. My other criticism is that the processes bucket is a catch all for a lot of stuff. This has the advantage of keeping the framework down to three, but the disadvantage of mixing a lot of different stuff together under this bucket. It also means that location and suppliers are probably given less attention when teams are using this framework. I have always been a bit uncomfortable with people, process and technology, the classic framework used by Business and Enterprise Architects. I have also criticized the Business Model Canvas categorization of Key Partners, Key Activities and Key Resources. 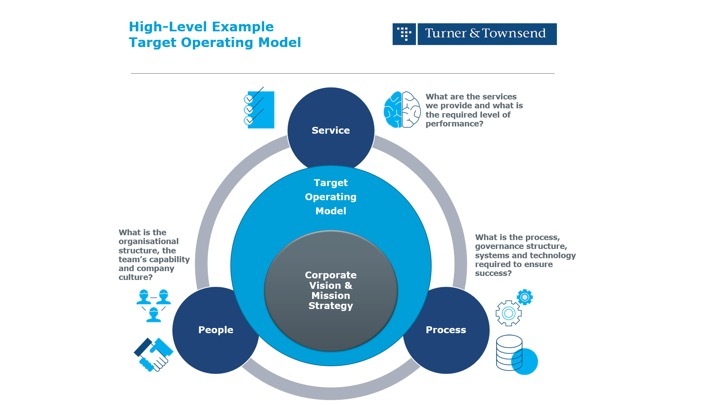 This Turner & Townsend framework is, in my view stronger than both. Like the BMC it has a focus on services. But its language and focus on people is much better than the BMC’s unfortunate ‘resources’. The bundling of process and technology together may not be so mad in an RPA world where most process work is done by technology. As always there is something to learn from everyone’s frameworks. This entry was posted in OM frameworks and tagged Business Model Canvas, Operating Model Canvas, Operating Models, Tuner & Townsend. Bookmark the permalink. Interesting framework, Andrew. Thanks for the pointer. Thank you for your comments. I tend to agree with your first point, although, I think we often overstate the amount of change that is really going on. The harvest still arrives in the Autumn, airplanes still fly to Sydney, people still eat hamburgers. The problem with calling the process dimension “capability” is that capability is delivered through “people, process and technology” and the process circle only contains process and technology. If I was trying to fit capability into the model I would put it in the “service” circle or the “strategy” circle – but this may be because I find the concept, as defined in Business Architecture, an awkward one! I find it more helpful to use “process” to mean one and not the other, as it leads to confusion as to what is “actually” being referenced. In that regard, one might speak of system and process as the two distinct concepts. From there, it is only a small step to the capability derived from the system (rather than the process). So, my advocacy for capability is in a system context to which the “process” is being inappropriately applied.